The front iron sight has some damage, but it is fully functional and has seen use on fields. I'm located in the Greater Detroit area and am willing to meet for the sale within a reasonable distance. Reduced cost and dropped battery. Discovered it no longer holds charge effectively. 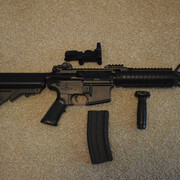 Might be interested as my first airsoft gun. I am brand new to the sport and was going to get my start renting at Motor City Airsoft until I could afford an entry level AEG. Is this Gen 1 or 2? Metal Gearbox? Does it have the interchangeable spring? Let me know when you have a minute. I'm in St Clair Shores so I am fairly close to you. Thanks for your interest! Since it's a likely question others will have, it's a Gen1 and I have never tried to take it apart, though you can likely replace any parts you wish. However, you will absolutely have to switch the spring out to play at Motor City.